Obverse – Closed zoom in to a typical view of the flowers and birds of the park. 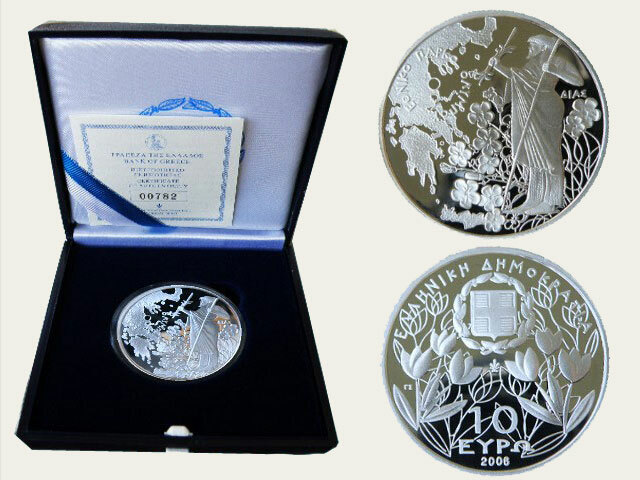 Reverse – National emblem of Greece inside an artistic representation of a tree. 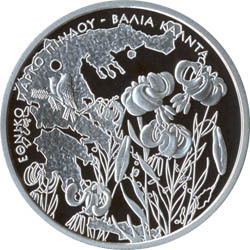 Obverse – In the obverse, The National Emblem Of Greece between flowers is depicted. On the top edge ‘Hellenic Republic’ is written in the Greek Alphabet. The face value of the coin is displayed along the lower edge. 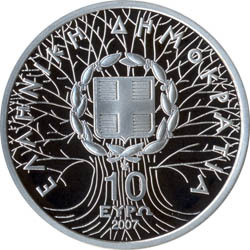 Reverse – National Emblem of Greece, sourrounded by the words ΕΛΛΗΝΙΚΗ ΔΗΜΟΚΡΑΤΙΑ (Greek Democracy) and the face value of €10 is shown. 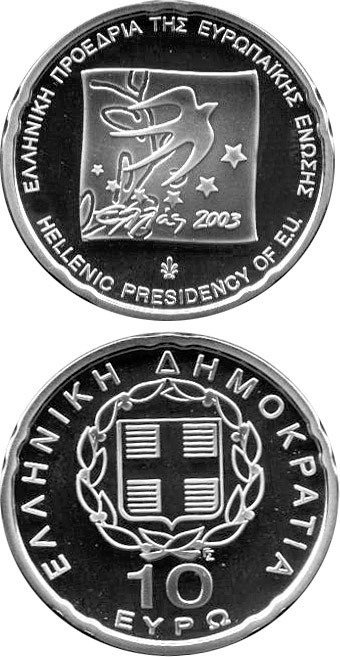 Interesting Facts – This coin was issued to commemorate the Treaty of Accession (2003), signed in Athens on 16 April 2003, with Greece holding the Presidency of the Council of the European Union.The Treaty of Accession 2003 was the agreement between the European Union and ten countries (Czech Republic, Estonia, Cyprus, Latvia, Lithuania, Hungary,Malta, Poland, Slovenia, Slovakia), concerning these countries’ accesion into the EU . At the same time it changed a number of points which were originally laid down in the Treaty Of NiceThe treaty was signed on 16 April 2003 in Athens, Greece and it entered into force on 1 May 2004, the day of the enlargement of the E.U. Interesting Facts – Alexander the Great (356-323 bc) was the king of Macedonia (Greece), conqueror of the Persian Empire, and one of the greatest military geniuses of all times. Alexander was born in Pella, the ancient capital of Macedonia, being the son of Philip II, king of Macedonia, and of Olympias, a princess of Epirus. Reverse – Αn ancient sailing ship (Trireme) ,denomination & year of issue. Obverse – Ioannis Kapodistrias, Denomination in Greece, Date to the Left, Initials Of The Designer appears at the lower left of the portrait Γ.Σ. (Γιώργος Σταματόπουλος), Anthemion over date. Reverse – The reverse (used from 2007 onwards) was designed by Luc Luycx and displays a map of Europe, not including Iceland and cutting off, in a semi-circle, at the Bosporus, north through the middle of Ukraine and Belarus and through northern Scandinavia. Cyprus is located further west than it should be and Malta is shown disproportionally large so it appears on the map. The map has numerous indentations giving an appearance of geography rather than a flat design. Six fine lines cut across the map except where there is landmass and have a star at each end – reflecting the twelve stars on the flags of Europe. Across the map is the word EURO, and a large number 2 appears to the left hand side of the coin. The designer’s initials, LL, appear next to Cyprus. Luc Luycx designed the original coin, which was much the same except the design was only of the then 15 members in their entirety and showing border and no geographic features. The map was less detailed and the lines the stars were upon cut through where there would be landmass in eastern Europe if it were shown. Metal – Bi-Metallic Brass center in Copper-Nickel ring. Interesting Facts – Voted “Best Trade Coin” 2004 by Coin World and F+W Publications – It is the 1st commemorative 2 euro coin ever issued. It is among the 37 rarest 2 euro coins from 2004 to now (according to mintage (31st place). Discus Throwing has remained virtually unchanged in the 28 centuries of its history. It is considered one of the most “noble” sporting events, since it did not have any direct connection with military exercises or farm work. In antiquity it formed part of the pentathlon. 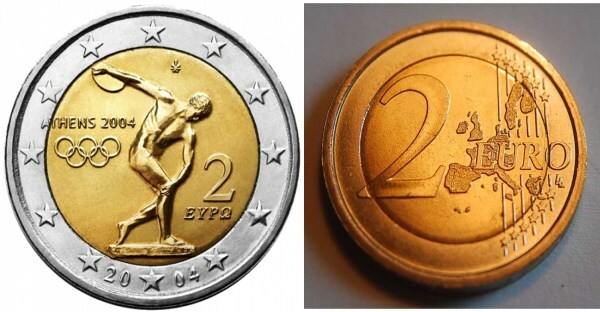 Interesting Facts – The side of euro cents cannot repeat the denomination of the coin unless the issuing country uses an alphabet other than Latin(currently, Greece and Austria are the only such countries, hence Greece engraves “1 ΛΕΠΤΟ” upon their coins).